President's Speech 2016 - rcsi-star's JimdoPage! As President of the RCSI it is a great pleasure and privilege for me to welcome you all here for this special occasion – the Conferring Ceremony for the Membership of the Royal College of Surgeons in Ireland. I extend a very warm welcome to your families and friends, many making their first visit to Penang Medical College, who have come to share in the celebration of your achievements. It is an exciting time for RCSI! And for all of you! 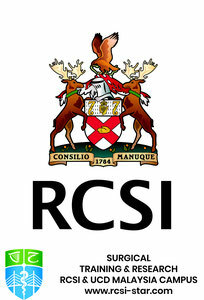 By way of background - the Royal College of Surgeons in Ireland – which is now a not-for-profit Health Sciences Institution was originally founded by Royal Charter from King George III of England in 1784, (that is 232 years ago), and has been resident on St. Stephen’s Green in Dublin since 1810. The Charter gave the College the power to control the practice of surgery and make provision for surgical education. The stimulus for growth in the early years was the demand for Army and Navy surgeons for the Napoleonic wars. We are unique in these islands amongst the Royal College of Surgeons of England, Edinburgh and Glasgow in that we have - as well as providing Postgraduate Education and Assessment in Surgery - a large Undergraduate Medical School which was founded in 1886. Our graduates receive Licentiates in Surgery, Medicine and Obstetrics, from our College as well as from the Royal College of Physicians of Ireland. Also because RCSI is a recognised College of the NUI since 1977 all medical graduates also receive MB BCh BAO. In 2010 the College received, from Government, our own degree awarding status. The Physiotherapy programme was established in 1999 and the Pharmacy School in 2002. Along with our surgical remit over the years we have expanded therefore into a Health Sciences Institution with Undergraduate Medical, Physiotherapy, and Pharmacy education (with now the largest Medical School in the state) and Postgraduate Education and Research in basic sciences, medicine/surgery, and pharmacy. Congratulations to you all on reaching this exciting step of your careers. You have demonstrated your desire to continue along the rigorous pathway that is a career in Surgery. You will now hopefully progress to further studies in the practice of Surgery with further study and clinical practice leading ultimately in a few years to FRCSI and then further qualifications in your chosen specialties. Irrespective at what stage you are in your careers this is a major achievement. Postgraduate qualifications require focus, time management, dedication and real commitment. It is indeed a tribute to you all to have been successful in your quest for further professional qualifications whilst working fulltime. We also welcome most warmly your families and friends who have supported you to this stage and who are here to share in celebrating your achievements. For all of you – today’s qualification is an important milestone in your training. The Membership of the Royal College of Surgeons is a prestigious, internationally recognized qualification and quality standard. Holding this qualification demonstrates to colleagues, peers, and employers a surgeon’s knowledge, clinical skills and commitment to his or her practice. RCSI constantly strives to support our exam candidates and to provide them with the resources necessary to meet this standard. We have recently developed a suite of video tutorials and online revision tools to help candidates ready themselves for all parts of the exam. We are also now offering the MRCS Part B OSCE preparation course in three countries: Ireland, Malaysia, and Bahrain. This is an excellent course that has received universally positive feedback and has dramatically improved the pass rates for those attending it. During the last year we have seen a significant growth in surgeons attempting the MRCS with RCSI. We have had record candidate numbers across all our centres, both at home and overseas, and this has materialised into our highest ever numbers of new members being conferred by the College. We are continuously working to improve our Membership exams offering. For this reason we will open new examination centres in Malaysia, India, and Malta during 2017. The opportunity to become a Member of RCSI is a privilege that is only earned through hard work and an absolute dedication to excellence. This commitment doesn’t stop the day a surgeon qualifies. In fact, it is just the start of a lifelong journey of learning and professional development. Abide by the tenets of your training in Professionalism. Remain ever grateful to your families and friends who have supported you to this stage of your careers in so many ways - both financially and personally. Be particularly grateful to your teachers and Research Supervisors. Keep in touch with them! Keep in touch with RCSI and connect with the RCSI Alumni network throughout the world which currently number over 15 ½ thousand in almost 100 countries. Continue to learn, teach and research – and you will make a difference. Thank you all and again many congratulations.